You don’t have to be an experienced gamer to play an Elf! Are Elves Difficult to Play? Some new players to AD&D are intimidated by playing the elven race. At first glance there are a lot of mechanics, rules, and restrictions to keep in line. Let’s take a closer look at the elf and warm those new gamers up to the idea. One of the struggles I met with elves, was that various players at various tables had different visions of what an elf looks like and how they behave. That led to a narrow pathway (and a different one) at some tables.Those notions inadvertently get pressed onto new players at the table. This could be due to various sources of inspiration and reading. Of course, the DM has final say, but most experienced DMs find the new player with new inspirations refreshing. It was one of the difficult obstacles I personally faced when initially playing an elf. Applying my vision to how I thought my character should act, despite other player’s attempted mandates, eventually shone through. Don’t be afraid of the fair elf, there are many sources of inspiration to call upon. Try it a few times, you might even love it. The core of elf mechanics are easy enough to find. I found them in the AD&D Players Handbook (Easley cover) Page 16. 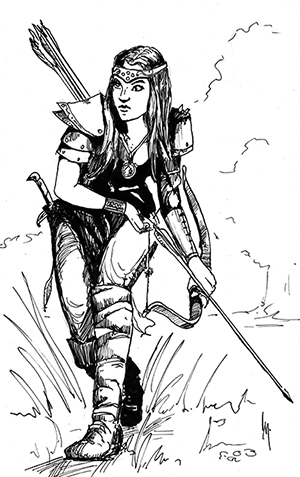 The PHB (Players HandBook) directs us to the Monster Manual (pg 39) for details on elves. There it introduces various sub-races which are not options for player characters (Until Unearthed Arcana). Aquatic, Drow, Gray, and Wood Elf. It does list the Half-Elf, which is a player character option and has its own entry. For new players, the level limits can be pushed out of the initial equation. Yes they play a factor in the long-term role, but how many characters in AD&D really press past 7th, 10, or 11th? Even more rare is a multi-class character pressing beyond these limits.Page 14 outlines level limits if you think they will have an effect on your level 1 elf decision. Elves have numerous benefits and are very strong characters early in the game. Start the game speaking 8 languages or more! Good chance to surprise if you are 90′ away from non-elves or with halflings. The tough break is a -1 to initial Constitution score. New players shouldn’t be intimidated by all these bonuses and mechanics. some quick notes detailed in the few paragraphs of the book will keep these things in check. Many of these adjustments the DM likely is aware of as well. Elves are woodland creatures, that much everyone can agree on. They are a bit mysterious, but are generally good folk. For all the assumptions more weathered gamers make about the AD&D elf, there are very few social details about them in the core books. Most of the descriptions are physical. Elves are slim of build and pale complected. Their hair is dark and their eyes are green. Their garb is typically pastel and of blue, green or violet (But often covered with a greenish gray cloak). The lifespan of these creatures is a dozen centuries long. Rest assured, in AD&D adventuring life, it’s not likely to last anywhere near 1200 years. The solution to being intimidated by playing an elf is to throw all caution to the wind and dive in head first. If you keep a few things in mind, it will be a fun and rewarding experience. They are generally Chaotic Good. Elves have time (12 centuries). These basic elements are standard at most game tables and are reinforced in the core books. Every race and class in the game is ready for every level of gamer and is ready to accept your imagination and vision. Try an elf if you are new, revisit them is you aren’t. Tell us about your favorite elves in the comments below.